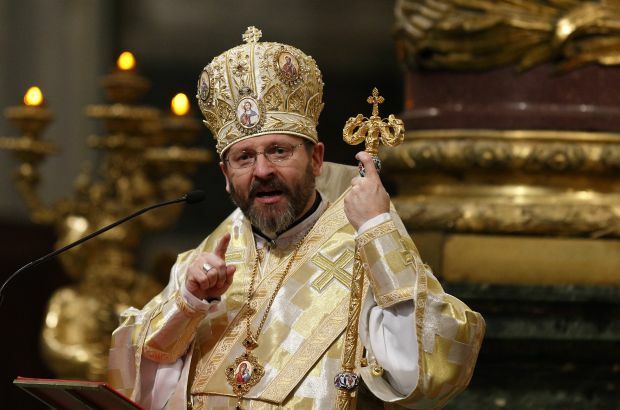 “It would be a prophetic gesture that would show the power of prayer and Christian solidarity, give us courage and hope and build a better future for everyone,” said Archbishop Sviatoslav Shevchuk, major archbishop of Kiev-Halych. The archbishop was in Rome following an “ad limina” visit Feb. 16-21 in which bishops from Ukraine’s Eastern- and Latin-rite traditions reported to the pope and the Vatican on the state of their dioceses. Archbishop Shevchuk spoke to journalists about the bishops’ Feb. 20 meeting with Pope Francis. He said the pope “truly listened to us with a paternal heart,” asking to hear about how the Ukrainian people, including their “Orthodox brothers and sisters,” were facing the current conflict and crisis. In a written address that was handed out to the bishops, the pope them to focus on the social and human tragedies unfolding in their country and avoid politicizing their role as church leaders. He asked the bishops to work together and be a clear moral voice calling for peace and harmony as well as strong defenders of families, the poor and weak. The pope assured the bishops of his prayers and concerns about the “serious conflict” in their nation and the numerous innocent victims and suffering it has caused. “In this period, as I have assured you on many occasions directly and through cardinal envoys, I am particularly close to you with my prayer for the deceased and for all those affected by the violence, with prayer to the Lord that he may soon grant peace,” he said. Pope Francis said he continues to appeal to “all sides concerned” to respect international law and carry out their agreements, especially a recent cease-fire deal. “In these circumstances, what is important is to listen carefully to the voices that come from the places where the people who are entrusted to your pastoral care live” because it is by listening to one’s own flock that they will be able to help uphold the community’s values of “encounter, collaboration, the ability to settle controversies,” he wrote. Archbishop Shevchuk said the path the pope was indicating was “right — to be at the side of your people and listen to the voice of the people,” and that it was the same approach the bishops have been taking the whole time by addressing social injustices and not supporting any political party. When it came to ecumenical dialogue aimed at peace, he said it has been very difficult to get the Russian Orthodox Church’s Moscow Patriarchate to help advocate an end to the violence. “If pastors are not able to listen to the voice of their flock and respect the sensitivity of their faithful, well, it becomes more difficult. If the church hierarchy takes the side of those with power against their own people, they lose their credibility,” he said. They told Vatican officials that some of the terms that had been used — for example, when the pope said Feb. 4 the conflict was a “fratricide,” a war between Christians baptized in the same faith — had been extremely painful to the people of Ukraine because it echoed the rhetoric in the Russian position on the conflict. He said he told the pope how more than 2 million people have been displaced by the fighting, among them 140,000 children. He said more than 6,000 people, mostly civilians, have been killed to date and another 12,500 people physically wounded. “The pope was touched by these numbers,” especially by how many children are being affected. Through Caritas Ukraine, the church is helping more than 40,000 people a day, he said. The people have opened their hearts to the church as a “stable point of reference” during so much confusion and misguidance, he said. The church has become a true “field hospital” as so many people are suffering spiritually and psychologically from anxiety, depression and post-traumatic disorder, which has become as real a threat to human lives as “the Russian-built missiles,” he said.